More often than not, I've spent a lot of time on this blog lamenting how the sequel of a movie brings the entire franchise down a peg (or three) in terms of overall quality. It is very, very rare that a sequel movie lives up to the reputation of the original what more stands a chance of actually surpassing it even. But I think that at least for this movie, the notion may just be true. 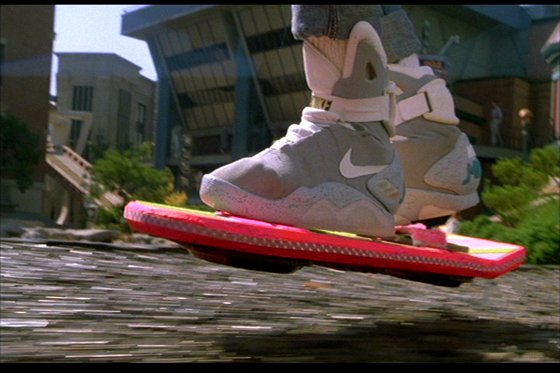 Back to the Future Part II remains one of the most memorable movies in the trilogy for me. I can't quite put my finger on why this is the case, but it probably has to do with the fact that our heroes actually do travel to the "future" - at least as far as late 1980's sensibilities go - whereas the first and third movies spent a lot more time in the past. Not that I have anything specifically against depictions of historical periods - you just have to admit how depictions of the future tend to be pretty cool. The movie also went on to provide even more examples of more "average Joe" friendly explanations of the effects of time travel, the challenges of causality and how alternate timelines are born. It may not seem like much today or to geeks such as myself, but one has to acknowledge how much effort the writers put into making sure that everyone in the audience stood a decent chance of figuring out what the heck was going on. And that's a rather admirable thing indeed. Synopsis: Back to the Future Part II is a 1989 science fiction comedy again directed by Robert Zemeckis with a screenplay by Bob Gale. It largely featured many of the same actors from the first movie with a few substitutions. At the end of the first movie, we saw Doc Brown (Christopher Lloyd) arriving from the future and telling Marty McFly (Michael J. Fox) and his girlfriend Jennifer (Elisabeth Shue) that they needed to travel to 2015 to save their children somehow. So they depart in a souped up version of the time-travelling DeLorean, which now has the ability to fly when it builds up the necessary acceleration to initiate time travel. Once there, Marty has to impersonate his son in order to refuse an offer to be made by Griff Tannen, the grandson of Biff Tannen (both played by Thomas F. Wilson). When they do get around to completing their little "mission", they return to find the world of 1985 has completely changed. Marty's father is dead and Biff seems to be in charge of all of Hill Valley. Thus Doc and Marty now have to figure out what changed their timeline completely and see if there's anything that they can do to reverse the effects and restore things back to status quo - or at least the status quo at the end of the first movie. Now the movie did a pretty stellar job of trying to reintegrate the sequel cast with the original movie production. The very scene in the movie already presented a bit of a challenge given that the role of Jennifer was no longer being portrayed by Claudia Wells and thus they instead had to re-shoot the entire sequence with Elisabeth Shue. And that kind of dedication to detail says a lot about Zemeckis and his vision for the movie, which again made every chance to revisit the timeline of the original movie all the more interesting. 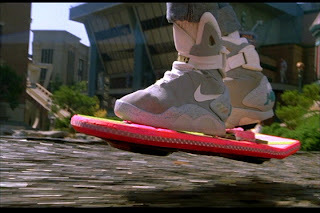 The way that they depicted the future remains one of the more iconic images of our geek history and I'm sure more than a few of you wanted those self-lacing Nike shoes and of course the Mattel hoverboard. It's ironic how those companies have been making efforts to release products in homage to those futuristic items, although we haven't quite mastered anti-gravity just yet. But the fact that they're trying to do this just speaks of the larger impact that this movie has had on our shared cultural history. There are moments when the time travel aspects of the movie do seem a bit daunting, but still if you press on you can trust how the writers (and of course the actors) managed to keep things generally understandable. And yes, this includes Doc Brown blatantly diagramming the changes to the timeline on a white board in case just an oral explanation proves insufficient for you. Beyond the visual appeal and the quirks of the science of the movie, on the whole it's a pretty fun adventure that did well in terms of telling the story in a manner that utilized the best movie-making technologies available at the time. You have that dinner scene with Michael J. Fox portraying multiple characters as one excellent example of a well through-out shot and of course all the other aging and de-aging make-up used throughout the movie to help align everyone with the time period they were being asked to represent. 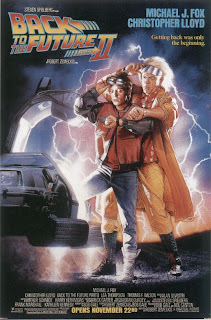 Back to the Future Part II is definitely one of those sequels that I actually enjoyed a bit more than the original movie. Zemeckis really brought things to a completely different level and the whole piece just came together quite beautifully. And of course there's the bonus of how he end of the movie already had a trailer for the third and final installment baked into it that added the cherry on top of this time-travel romp. Thus the movie rates a full 5 running gags that cross generational lines out of a possible 5.